We are delighted to have been nominated for Best Forum in The Football Blogging Awards. You can vote for us on their website here and via twitter here. You can read the caf thread here. Thanks to anyone who votes for us. Think he will have great season. Signing Fred should also help, not Pogba but team in general. He'll be coming back from a great World Cup, hope he can keep his consistency. If he can reproduce his World Cup form in the league this season he’s the best midfielder in the league. Really hope he kicks on to the next level this season. I'm the only one who thinks he's going to leave this summer ? Yes. What are your thoughts based on? Fairytale? Being negative for the sake of it? Yes. What are your thoughts based on? Fairytale? Yes, no chance of that happening. We wouldn't have time to find a proper replacement. Anything reliable that you care to share? Which clubs is he linked to that could afford him? Considering he would cost well over £100m and he’s not for sale. His relationship with Mourinho is pretty bad. And don't underestimate Raiola. I think that it will be a good thing for his career to leave. And for the club too, Pogba isn't the ideal CM for a Mourinho's team. Considering you didn’t answer my questions and didn’t share any reliable sources, I’d kindly ask you to stop talking nonsense in the performance thread. I’m hoping he plays with the same maturity & leadership as he’s shown in the World Cup. Will be a big season for him. Mate, what are you doing? There's plenty of threads to discuss speculation, albeit from hardly reliable sources. When the news first came through that Raiola left the Barca offices the main line was that it was regarding one of their youth players. Think it's a case of mischief making, IMO. If Pogba wins the world cup can he have a sniff at fifa world 11? Not this year. Maybe next season if we don't show any ambition of winning the PL or CL. "This is not the same team, this is the French team, the other is Manchester. It's not the same system, I'm not doing the same thing,"
It's actually the vibe that comes from several journalist that works for the main french sources RMC, L'Equipe and RTL. They seem convinced that Pogba and Mourinho have a bad relationship. They have nothing to back this ‘vibe’ up though. Apart from last season when he was subbed, which was later confirmed that he was ill and carrying a knock. Beside all that, the player isn’t for sale, has a 3 year Contract and any club trying to force United’s hand would have to bid way over £100m and match/better his £350k per week wages. My guess is Coutinho/Dembele money, so let’s say around £140m. What club can afford that, that needs him in their team? I have no idea about why they think that, as you don't too, it's not about substitution though. My point is just that Jib didn't invent it, personally I didn't mention it here and I won't extensively talk about it. Nah, he was great for Juve as well. Just not suited to our system. I don't agree. System has feck all to do with playing it simple and working hard defensively. This is something he has to do on his own. He has showed he could do it in many matches for United. They also had better managers for Pogba. 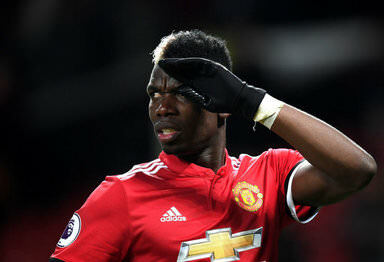 At this point it's fairly clear that Pogba is at his best when he has a clearly defined and limited role, the free approach that Mourinho seems to favor for non defensive players doesn't work with Pogba and it doesn't work with all players, not everyone can make good use of great freedom. He also can't do everything alone, he can't be the main creative and destructive force which goes with what you are saying better players with better roles will help everyone. Pogba is better at United than Juventus, a more well rounded player. But Juventus had world class players all over the pitch which meant him having a bad game didn't matter that much. When you are the talisman of the team you have to be very consistent, which Pogba isn't yet. Most midfielders don't reach the level of consistency until their late twenties. I hope he has a standout season. Because if he doesn't, either he leaves or Jose leaves. Not far fetched. I have a feeling Pep wasn't lieing about the attempt made by Pogba's agent to transfer him in January. Add that to recent rumours by Spanish and Italian papers that he is unhappy at United and there just might be something there. Our constant links to SMS could also be indicative. My first thought is that no way is Pogba leaving but who thought Ronaldo would be in Juventus 4 weeks ago? Pogba has been very good for United many times. He just hasn't been very good for United consistently enough. A World Cup tourney is just 7 games. Very easy to conclude that 'he has been better with France than with United'. An Italian guy living in Manchester. Pogba has put in some quietly impressive performances this world cup, and I think his level of performance indicates why it is important to have skilled and confident midfielders around him. Playing alongside Kante and Matuidi gives him more creative licence, but he also seems to have a telepathic understanding with the forwards, particularly Mbappe, which allows him to play at his best. When he energetically won the ball back and played that worldly pass to Mbappe vs Belgium, I was reminded why our club paid such a hefty fee for him. He did this several times during the game to great effect, several times I saw Kylian giving Paul the thumbs up, acknowledging great service. Everyone seems to talk about Paul being "Lazy", but it isn't him that is lazy, it's our football. It seems he gets more appreciation, when playing for france, for his Defensive play, interceptions, breaking up play, passing, marking, than when he plays for United. Here's hoping he lights the world up tonight. I personally don't conclude it because I know how he was playing before the world cup. Very remiscient of his Utd form. This tournament has been a nice change with him. ivaldo Mediocre Horse Whisperer, s'up wid chew? Collectively, it seems people want Pogba to do everything. Some expect him to dictate play, while others want to see him scoring 20+ goals a season, or being the playmaker of the team. He can't do it all. Put him in an advanced role and he'll score goals, put him with ball winning midfielders and he will create chances, play him slightly deeper and he will control the tempo of play, but don't expect him to do it all. Personally, I really enjoy his current role and performances for France. Not very flashy but oh so important in terms of dictating the tempo. I think he'll stay. The window shuts before the season starts this year, so selling him now with such little time to find a replacement would be suicide. Even when out of form, he is still our most productive midfielder in possession. Jose needs to take notes, this is how you get the best out of the lad. If he fails to shine next season I will blame the manager that as much as I will the player. He has some pass on him to unlock defences.